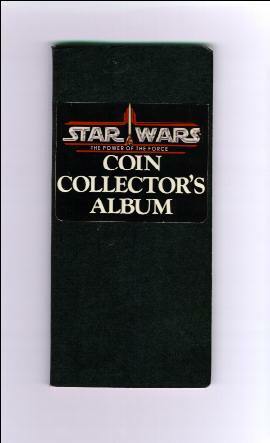 Until this find, the only evidence of the POTF coin album (shown here) was a piece of artwork depicting the front cover and inside. The album holds eighteen coins as shown in the picture of the inside of the album. This album was going to be offered as a mail away item on the 93-Back Power of the Force cards. This prototype is made of cardboard, glue, and felt--surely not what the final product would have been.